en su hábitat natural, sobre fondo arenoso con pastos marinos. Foto: José Espinosa..
3 m depth at Punta Calerita, near La Paz, Baja California Sur, Mexico. 30 Nov 2016. Frithjof C. Kuepper (fkuepper@abdn.ac.uk). © Frithjof C. Kuepper (fkuepper@abdn.ac.uk). 1. Habit. 2. Upper subtidal. Nhatrang Bay, Vietnam).. 29 Feb 2012. Eduard and Tamara Titlyanova (etitlyanov@mail.ru). © Eduard and Tamara Titlyanova (etitlyanov@mail.ru). According to Silva et al. 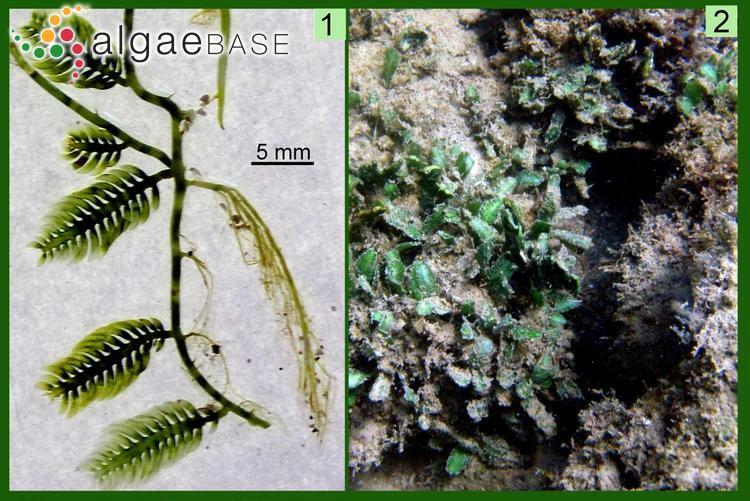 (1996) the name Caulerpa pinnata has been misapplied to this species by Greville (1853a: 1-2, pl. I: upper figs. 1,2), Greville (1853b: 197-198, pl. III: upper figs. 1,2) and Weber-van Bosse (1898: 290, pl. XXIV: fig. 1). 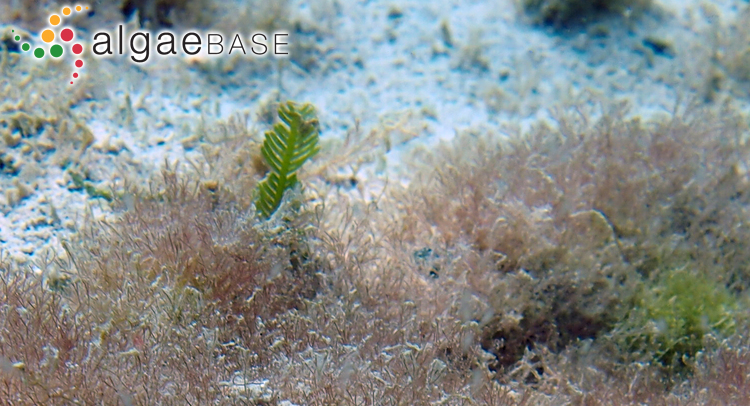 Type locality: Atlantic Coast of Mexico (Lipkin & Silva 2002: 63). Type: L (de Bolós & Masclans 1955: 63). Olsen, J.L., Valero, M., Meusnier, I., Boele-Bos, S. & Stam, W.T. (1998). 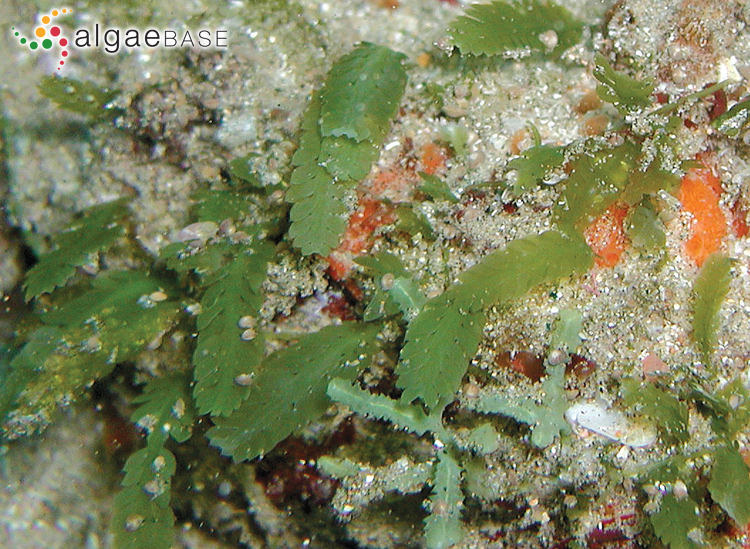 Mediterranean Caulerpa taxifolia and C. mexicana (Chlorophyta) are not conspecific. Journal of Phycology 34: 850-856, 2 figs, 2 tables. Ukabi, S., Shemesh, E., Dubinsky, Z, Hershkovits, G. & Israel, A. (2014). 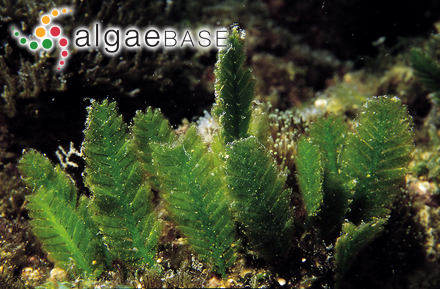 Molecular authentication of Caulerpa (Chlorophyta) species along the eastern (Israeli) Mediterranean shores. Botanica Marina 57(1): 67-71. Accesses: This record has been accessed by users 6178 times since it was created. Chisholm, J.R.M. & Jaubert, J.M. (1999). Comments on the article of Olsen et al. 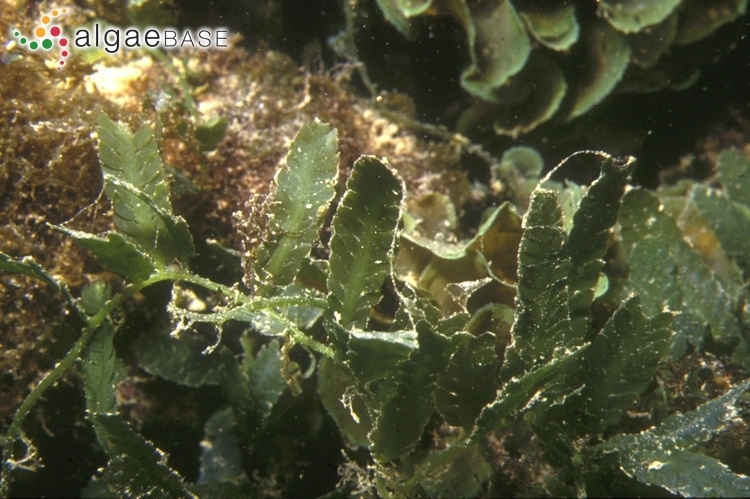 (1998): Mediterranean Caulerpa taxifolia and Caulerpa mexicana (Chlorophyta) are not conspecific. Journal of Phycology 35: 438-440, 1 fig. Fagerberg, W.R., Hodges (Lavoie), E. & Dawes, C.J. (2010). 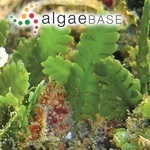 The development and potential roles of cell-wall trabeculae in Caulerpa mexicana (Chlorophyta). Journal of Phycology 46(2): 309-315. Fagerberg, W.R., Towle, J., Dawes, C.J. & Bottger, A. (2012). 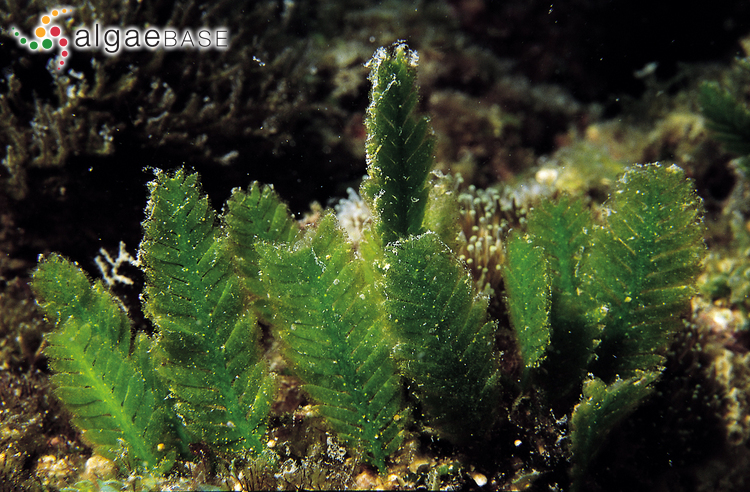 Bioadhesion in Caulerpa mexicana (Chlorophyta): rhizoid-substrate adhesion. Journal of Phycology 48(2): 264-269. Giaccone, G. & Di Martino, V. (1996). 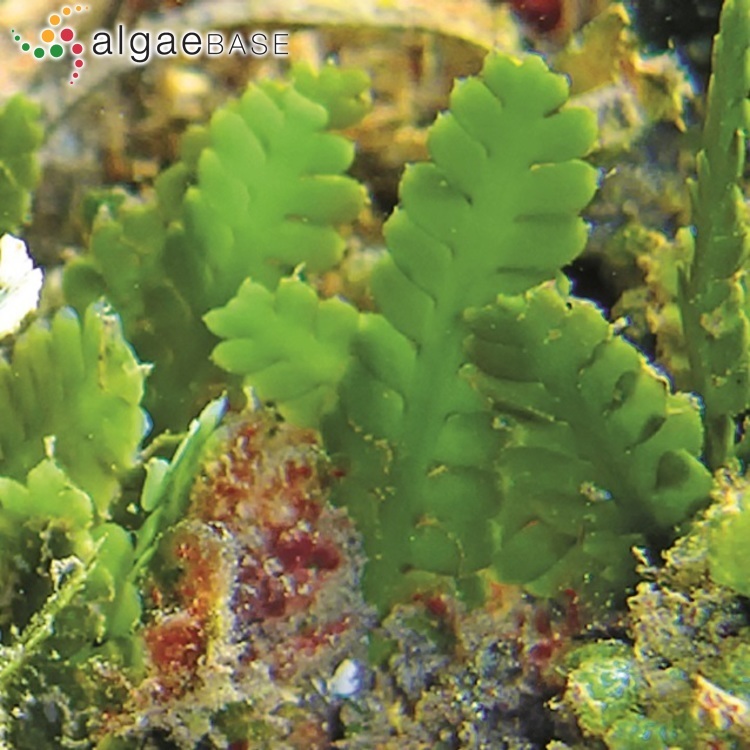 La vegetaziones a Caulerpa mexicana Sonder ex Kützing nello Stretto di Messina (Sicilia Nord-Orientale). Boll. Acc. Gioenia Sci. Nat. Cataia 28: 75-91.